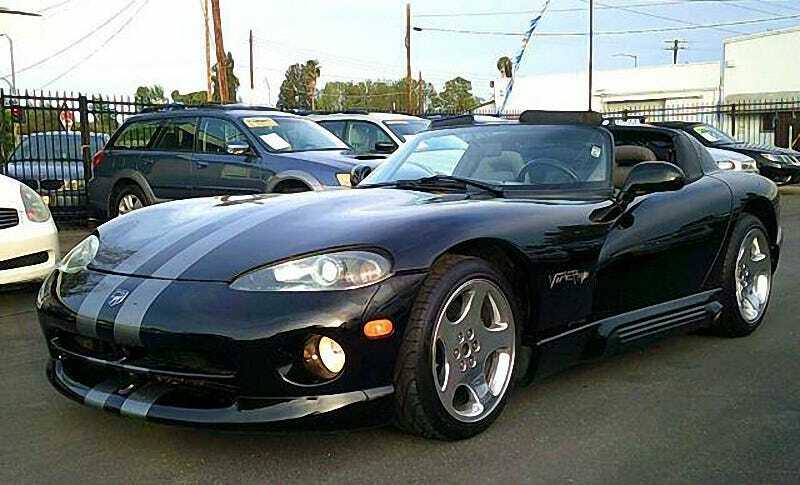 For $25,995, Might It Be Time To Buy This 1994 Dodge Viper RT/10? Surrounded on the lot by far more plebeian fare, today’s dealer-offered Nice Price or Crack Pipe Viper is nonetheless just another used car. Let’s see if this one’s oddly low price might make it a true impulse buy. There’s a price threshold here for pretty much any car no matter how rare or interesting. For a lot of us that threshold is around two-thousand dollars. Below that and most of us think whatever the car it’s throwaway transportation. Above that though, and you have to actually start thinking about the car itself and what sort of value proposition it provides. Yesterday’s 1983 Toyota Corolla wagon asked more than two-grand. In fact however, the consensus seemed to be that its condition warranted that threshold price and not nearly double, earning it a sad 58% Crack Pipe loss. Sad! Not all cars fall into the two-grand decision set. Cars like today’s 1994 Dodge Viper RT/10 always trade in more rarified air, although this 61,000-mile example seems to be at one of that air’s lowest altitudes. If you look at the market for these cars—which honestly has a very small audience owing to their basic and somewhat dangerous nature—you’ll find that they are currently trading for around $32K. This one is substantially less. Not only that, but it’s being offered by a dealer who will finance the sale, making it an even more intriguing opportunity. You know the drill when it comes to the RT/10; it was a raw and basic car— an anvil if you will—featuring an 8-litre, 400-bhp pushrod ten and manhandle-able six-speed stick. There are no electronic nannies on the car to try and keep you out of trouble each time you dip a toe into the throttle, and dip a toe you will because the result is just so damn much fun. It’s like doing heroin, or so I’ve been told. The ad notes that this car is for those who ‘want to make that half-hour commute in 15 minutes.’ Sadly, that’s pretty much it when it comes to the car’s description, although they do note the fact that ’94 and newer cars came with A/C. Other than that, we can glean from the pictures that the black with silver stripes bodywork looks to be in fine shape. The factory five spoke alloys are either chromed or (better) brightly polished and clear coated. Of note, there’s a chip in the right stripe on the nose, but other than that the lights haven’t yellowed nor are there any other signs of wear. The interior on these early Vipers was kind of a joke. You would have expected better quality from a watch bought in an alley, but this one seems to have held up well. The driver’s throne shows typical signs of wear but not wear-through, while the wheel, shifter and brake all still wear their factory dead cow with pride. There’s no way of knowing how the car is mechanically seeng as the dealer doesn’t give any detail. Hell, they don’t even let us see the big mill in all its red crinkle finished glory. Still, it’s a dealer. Are they going to sell you something that’s not in at least reasonable shape when you go to inspect it? It also does come with a clean California title. Okay, let’s get back to that price. As I noted, ’94 model year Vipers are going these days on average, north of thirty grand. This one is asking $25,995. What do you think about that? Does that seem like a loss-leader for this dealer? Or, is that price still too snake-bit for this Viper? Sacramento Craigslist, or go here if the ad disappears.